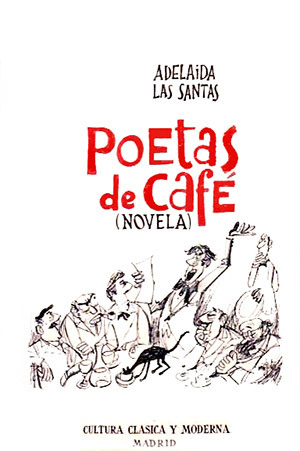 Poetas de Café, by Adelaida Las Santas, Editorial "Cultura Clásica y Moderna," 1959; second edition: Aguacantos, Madrid, Spain, 1992, 382 pages. WE'VE SEEN SOME HELLA POETRY reading scenes in the Bay Area. None of us are old enough to remember the Berkeley Renaissance with Duncan and Spicer in the late forties, and Michael McClure and Gary Snyder are the only survivors of the Six Gallery reading which premiered "Howl" in 1955, but I was there in June 1968 when Andy Clausen read interminably dressed only in an American Flag necktie, and then there was the Grand Piano series in the late 1970s that birthed Language Poetry, the Café Babar series in the '80s featuring a punk affect of "poetry you can actually read," and so on down to the Woolsey Heights series a couple of years ago with young MFAs overflowing people's houses in North Oakland. And then whatever's next. Add in all the contemporaneous and overlapping scenes in Chicago, Seattle, New Orleans and New York, in Paris and Stockholm, Melbourne and Buenos Aires. In Mexico City in the '70s the cutting-edge was the infrarrealistas, a bunch of punks who broke up older poets' readings and cacophonied their own. Never mind that these movements often brought more heat than light; their common denominator was an intense camaraderie of poets surfing a wave that was breaking into the future. And their vitality was frequently chronicled in prose by participants for whom this was the moment of a youth and of a lifetime. Jack Kerouac was there for the Beats and the Six, Charles Potts supplied eidetic memory of Berkeley 1968 in his memoir Valga Krusa, and Roberto Bolaño lovingly caricatured the excess of the infras in his best-selling The Savage Detectives. This piece is about a book that tells the story of a poetry scene that's long forgotten. In May 2017 I was visiting Spain enjoying my role as a famous translator. On my final day in Madrid, browsing kiosks of literary miscellany along the Puerta del Angel Caído on the corner of the Parque Retiro, I picked up a modest volume entitled Poetas de Café, by Adelaida Las Santas, which recounts the poetry reading scene in Madrid in the early 1950s, in the dull days of the Franco dictatorship. 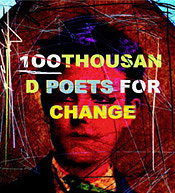 The cover (by the artist Mingote) caught my eye: a young poet expounds his verses to the sky, while at the café table his fellow poets listen in attitudes varying from skepticism to full slumber. A waiter who's seen it all hovers in the background, while a scrawny cat takes advantage of everyone's poetic absorption to steal a lick of cream from somebody's coffee cup. Adelaida Las Santas was twenty-three years old in 1950. She had a day-job typing in an office, which she hated. By night she prowled the cafes of Old Madrid, the Café Varela, the Sésamo, the Selecta, the Lisboa, the Tartesos, the Adelfos. There was a poetry reading every night of the week, usually starting very late. The most prestigious series was entitled Versos a medianoche, but the action rarely got started before one a.m., and after the readings the poets would prowl the streets till dawn, often ending up in the bohemian Barrio Lavapies for coffee at dawn. It was a point of honor never to sleep. Ah youth! Lightly disguised as "Lalia," Adelaida tells her own story and that of her poet boyfriend "Gerardo," in RL Guillermo Osorio (1918-1982), an ex-Loyalist fighter who endured exile and concentration camps, drank prodigious amounts of wine, never slept, despised most of his fellow poets, and wrote highly rhetorical and polished sonnets. Lalia, a decent, unlovely Catholic girl in a context when all those categories carried enormous weight, sympathizes moderately with Franco. They're in love; they're out of love. After enormous hesitation, Lalia yields herself sexually to Gerardo, who becomes even more emotionally unavailable. At the end of the book, he abandons her for the existentialist scene in Paris. In RL, Adelaida married Guillermo, rescuing him from his extreme poverty if not his alcoholism, and started a small press, Aguacantos, to publish both their work, including Poetas de Café, and that of their friends. That's the plot, such as it is, but the real arc of the story is the momentum of the poetic scene. Lalia considers herself a "poeta rebelde." At one point when an older poet is reading she interrupts him, shouting "Enough of this nineteenth century stuff! Make way for the young poets!" Everybody shushes her, but she's made her point. As the scene builds, a huge "Festival de Poesía" is organized to jubilant celebration. Finally and abruptly the whole poetry reading scene is shut down by a decree from the regime, with no explanation nor any possible appeal. As a novelist, Adelaida Las Santas isn't really. She served as secretary of various reading series, and consistently lists the names of every single poet who read anywhere, but frustratingly declines to excerpt lines of their actual poetry. One whole chapter consists of nothing but such lists. I guess you had to be there. But her dialogue is lively and her observations can be cutting: "when they read, the poets seemed like children, begging for attention, although their verses were mediocre." del dolor más hiriente y más herido. Held-in clamor carved into a figure. of pain most wounding and most wounded. and my assistant talks to herself. to the poor who can't afford down payment. and people hate us and we say: Life! This happens, sirs, and I must say it. At one point Lalia asks herself "¿Hay algo más hermosa que la poesía? Is anything more beautiful than poetry?" I am grateful to Adelaida Las Santas for rescuing a place and time bursting with poetic youth which would otherwise be deservedly forgotten. John Oliver Simon (1942-2018) was a poet of the Berkeley sixties and a long-time Poetry Flash contributing editor. Published from Abraxas to ZYZZYVA, he was a distinguished translator of contemporary Latin American poetry, and received an NEA fellowship for his work with the great Chilean surrealist Gonzalo Rojas. 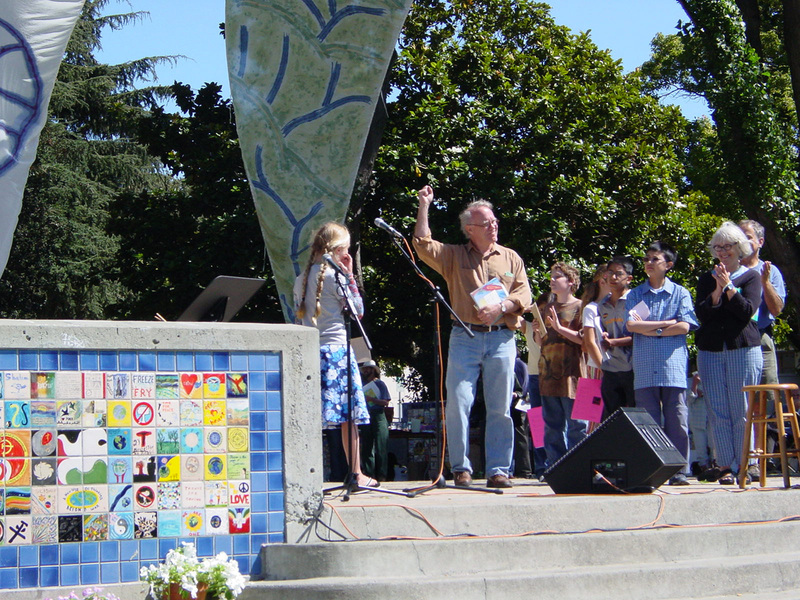 He was Sage on the Stage at California Poets In The Schools, where he worked since 1971, and was the River of Words 2013 Teacher of the Year. His ninth full collection of poetry is Grandpa's Syllables (White Violet Press, 2015). For his decades of service to poetry, the Berkeley Poetry Festival gave him its 2016 Lifetime Achievement Award.